Jombang is one of regency in East Java province that has a lot of tourism potency. Jombang has various beautiful nature panorama and the other potency of interesting tourism object. This is very important and profitable, because Jombang location is near to nature tourism area of Malang in southeast side and Pacet – Trawas – Tretes in east side; and historical tourism (Mojopahit Sites) of Trowulan. Tirta Wisata: Local tourism object that has fishing rod pool, swimming pool and tennis court. It is located in Jombang – Surabaya road and often held any concert of local or national artist. Pujasera Kebonrojo: Local tourism object that usually visited in holiday, located in the center of the town. There are many food merchants who offer traditional food and drink. Now day, this area is equipped with children playground. Battle Plane Monument: Located in front of Tirta Wisata. The Battle Plane that was squadron armadas of Indonesia Marine Military has gave to Jombang government and used to complete Jombang’s tourism objects. Aloon – Aloon / Town Square: Aloon-Aloon or Town Square is the tourism object in Jombang that most often visited by many people, without any money to pay ticket. 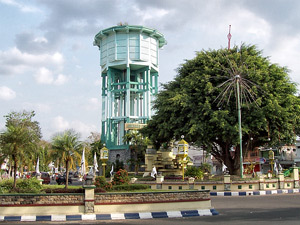 It offers beautiful park and four pillars of Mosque tower that become the symbol of Jombang town. In Sunday, this place is crowded by many people for having sport, jogging, football, and another activities. If you feel thirsty, you can buy drinks and snacks that sell around Aloon-Aloon. In certain days, there are interesting event held here, such as; exhibition, music, competition, etc. Located in Made village, Kudu district. There is historical inheritance of Airlangga King’s meditation place. Beside Sendang Made, there are the other smaller sendang / pool around it, such as; Sendang Payung, Sendang Padusan, Sendang Drajat, Sendang Sinden and Sendang Omben. Sendang Made self, has believed as the inheritance of Mojopahit Kingdom. Arimbi Temple was the south gate of Majapahit Kingdom. It is located in Ngrimbi village, Wonosalam district. Its location is very strategic because stay in the main road of Mojoagung – Wonosalam. It is nature tourism that managed by government instance of plantation and often visited by local tourists. The cool and comfortable nuance with many trees and warm swimming pool. The horticulture area with mountain topography that located in Sambirejo village, Wonosalam district has functioned to hold water and conservation field. Today, Panglungan has developed as agro tourism with some main plantation, such as; cocoa, clove, melinjo, and coffee. It is a beautiful waterfall with 158 meters height and located on 1250 meters height over sea. This waterfall is located in Tretes sub-village, Galengdowo village, Wonosalam district, about 40 km of the center of Jombang town. Jombang has nature mountain tourism that very beautiful and has big potency to developed as commercial tourism. One of beautiful nature tourism in Jombang is Sigolo-Golo cave that located in Kranten sub-village, Panglungan village, Wonosalam district. Kedung Cinet is natural mountain tourism with clear river water and crossed by “Shaky Bridge”. It is located in Pojok Klitih village, Plandaan district. It is located in Plabuhan village and has about 3 ha width. It is located about 4 km of chief of Plandaan district office. This dam is suitable for having picnic because it has beautiful panorama. Jambe Dam is located in Jambe sub-village, Bangsri village and has about 2,25 Ha width. Beside used as river system, this dam is also an interesting tourism object. It is about 2,5 km of chief of Plandaan district office. Religious House: Jombang has known as religious town. There are many religious houses in this town and the big of them are Tebu Ireng, Bahrul Ulum Tambak Beras, Denanyar and Darullulum Peterongan. K.H. Hasyim Asy'ari is the founder of religious house named Tebuireng (Jombang) and one of the founders of Islam organization that is Nahdatul Ulama. His son, K.H. Wachid Hasyim is the first Religion Ministry in Indonesia. These two national heroes graves is located in Ponpes (Islam Religion House) Tebuireng, Cukir, Diwek district. Sayid Sulaiman is one of Islam spreaders in Jombang area in Mojopahit collapse era. In night of Jum’at Legi (special Friday in Javanese culture), this grave is crowded by pilgrimage. It is located in Betek village, Mojoagung district. Pengajian Padang Mbulan (Islam activity, pray and read the Qur’an together) is continuously activity that held every full moon. This activity is open up by a cultural person Emha Ainun Nadjib (Cak Nun). It has held in courtyard of Cak Nun’s house in Menturo village, Sumobito district. Located in Gudo village, Jombang. Beside it is known as Tridharma religion place (Buddha, Taoism, and Konghucu), this temple is also a place for medical. The interesting of this temple is, the people who come to take medicine are ordinary people. Every Chinese New Year (Imlek), this temple held some noisy event, such as; Potehi puppets and dragon dance performance. Mojowarno Church is the oldest Church in East Indonesia area, and it was the center of Christian Protestant in Ducth colonialism. Once a year, this church is held Kebetan ceremony and Unduh-Unduh, which full of local culture. Located in mount slope, in Wonorejo village, Wonosalam district; that is to border on Kediri regency. This grave is located in Wonomerto village, Wonosalam district.